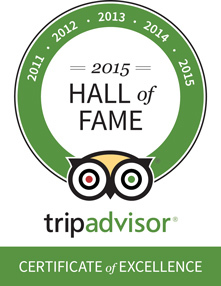 SABI SAND GAME RESERVE, MPUMALANGA, SOUTH AFRICA – 20th , May, 2015 – Inyati Game Lodge today announced that it has been recognised as a TripAdvisor® Certificate of Excellence Hall of Fame winner. The Certificate of Excellence award celebrates excellence in hospitality and is given only to establishments that consistently achieve great traveller reviews on TripAdvisor. The ‘Hall of Fame’ was created to honour those businesses that have earned a Certificate of Excellence for five consecutive years. Winners include accommodations, eateries and attractions located all over the world that have continually delivered a superior customer experience.